Last updated in April 2019, here’s a list of informal articles posted to the mighty Mud Songs blog that might be helpful for anyone on the island of Newfoundland, or in a similar cold climate, interested in starting up a few honey bee colonies for the pleasure of it. While some of these posts could be updated with better information, I’m confident most of the information is reliable. Strategies for maximizing production and profit will not be found here. These are some things that have worked for me as a hobbyist beekeeper since 2010. That’s all. Beekeeping Books For Beginners — A small collection of beekeeping books and online beekeeping resources that have been helpful for me. Beekeeping Start-Up Costs in Newfoundland (as of 2016) — A list of everything most new beekeepers in Newfoundland might need to get through their first year of beekeeping. Assembling a Beehive — The first post on this blog, one that shows how I assembled my first hive. How to Paint Beehives — Acrylic latex paint and a brush plus a couple of saw horses and some scrap lumber and you’re off to the races. Homemade Bottom Board — There’s nothing easier to make than a bottom board. This post shows how I make them cheap and easy with no carpentry skills. Homemade Screened Bottom Board — Exactly like the other homemade bottom board, only with a big hole cut in the bottom stapled over with screen for greater ventilation. Hive Tool For The Colourblind — I wrap yellow duct tape around the middle of red hive tools so they’re easier to find when I drop them in the grass, which I do all the time. How To Install a Nuc — A full 25-minute tutorial that shows exactly how I start up a 4-frame nuc on day one. 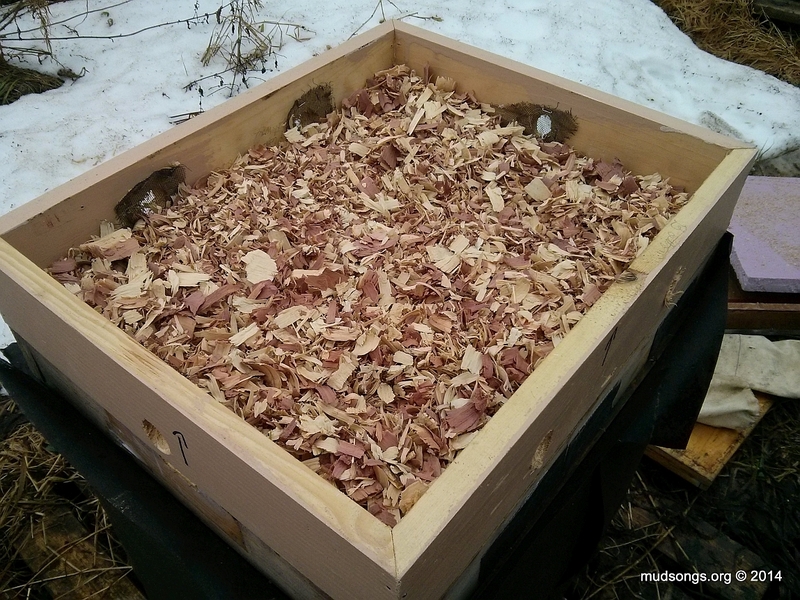 How To Care For Nucs — Some friendly tips on building up a honey bee colony in Newfoundland from a nuc. Nucs can be ordered from G & M Family Farm (in Placentia) and the Newfoundland Bee Company at NFBeeCo@gmail.com (in Pasadena). Mixing Sugar Syrup — A short video that demonstrates how I mix sugar syrup with a bucket, a stick and a garden hose. It doesn’t need to be nearly as complicated as some people make it out to be. Frame Feeders / Division Board Feeders — How I slightly modify and use frame feeders to great effect. Refilling a Frame Feeder — A video that demonstrates how easy it is to fill a modified frame feeder without disturbing the bees. Kill-Free Hive Top Feeder — A simple, cheap modification to hive top feeders that prevents drowning. Installing a Jar Feeder — Some basic tips on how to make and use a jar feeder. Making a Ventilation Rim — This cheap and easy-to-make ventilation rim (a.k.a. a ventilation eke) goes a long way to maintaining the health of a honey bee colony. The commercially available but more expensive D.E. Hive creates a similar effect. Using Moisture Quilts — The ventilation rims are easily converted to moisture quilts that keep honey bees warm and dry during the winter months. For my money, it is the best (and most affordable) ventilation aid ever invented. An emergency moisture quilt (i.e., a converted ventilation rim) that saved this colony in January 2014. Inserting Frames Into The Brood Nest — A demonstration of a method used to expand the brood nest. A Tidy Way to Create Drones — Inserting a foundationless frame near the edge of the brood nest in the spring as the cluster begins to expand is a cheap and easy way to give the queen room to lay drones, and it makes for a much less messy hive. How to Reverse Brood Boxes — A video demonstration of moving the brood chamber to the bottom of the hive in the spring to prevent swarming (not usually a concern during the first summer). How to Do a Full Hive Inspection — A long video that details pretty much everything I do whenever I inspect a hive. Dealing With Wasps — Established colonies can defend off wasps, but here’s the wasp trap I use to kill them. Water Dish for Bees — I don’t think beekeepers in Newfoundland need to worry about their bees dying of thirst. But here’s an easy, pretty way to give them water. How To Move a Hive — Illustrated step-by-step instructions on how to move a Langstroth hive a short distance. Making Sugar Syrup and Pollen Patties — A video that demonstrates how easy it is to make protein patties from commercial powdered pollen substitute. In another post, I also write about when, why and how I give my bees pollen patties. Bee Sting Remedy — After scraping the stinger out of my skin, I usually apply witch hazel to bee stings for relief. Dry Sugar Winter Feeding — One of several videos that demonstrates one method for feeding bees in the winter by pouring sugar in the hive. No-Cook Sugar Bricks — The simplest and least messy method of making sugar bricks (or cakes) that can easily be slipped into a hive in the winter without exposing the bees to cold air. Feeding Bees Crystallized Honey — Got leftover honey that’s crystallized in the jar? Feed it back to the bees. They love it. Keeping Mice & Shrews Out of The Hive — Shrews can get through 3/8-inch mouse guards, so I use quarter-inch / 6mm mesh to keep both critters away from my bees. I consider 6mm mesh absolutely essential to my beekeeping. Attaching Mesh with Thumb Tacks — The bang of a staple gun when installing mesh or winter wrap can disturb the bees. Thumb tacks don’t. Wrapping Hives for Winter — A demonstration of using Type 15 asphalt felt to protect hives from cold winds in the winters. Making Insulated Inner Hive Covers — This is essentially a piece of R-7.5 hard insulation over the inner cover that’s used to reduced condensation inside the hive and prevent the bees from freezing to death in the winter. How To Prepare Your Beehives for Winter — A long rambling post that shows how I prepare my hives for winter as of 2015. Monitoring Bees With a Stethoscope — A $7 stethoscope can be used to listen to my bees in the winter, more or less to check if they’re still alive. Monitoring Bees with Flir One Thermal Camera — An expensive device that most hobbyist beekeepers don’t need, but it may be worth the expense if it means preventing colony death over the winter. How To Use an Escape Board — A video that demonstrates how I use a bee escape board to remove bees from honey supers before the honey harvest. Cut Comb + Crushed & Strained Bottled Honey — A video with photos that demonstrates how I make cut comb (that’s raw honey comb) and crush the honey out of some comb and then bottled it, all very low tech in the simplicity of my kitchen. Extracting Honey — Videos and photos that show how to harvest honey using an extractor. Requeening a Hive — A basic rundown of how to install a mated queen, though most new beekeepers shouldn’t have to worry about requeening until their second year at the earliest. EpiPen — The dark side of beekeeping is that some people, even people who have been stung many times before, can have an anaphylactic reaction to a bee sting that is life-threatening. I always have an EpiPen near by just to be safe. Queen Rearing — I don’t rear my own queens. I’ve always wanted to, but I could never find the time. When I need to requeen, I order mated queens from the Newfoundland Bee Company at NFBeeCo@gmail.com or the G & M Family Farm. I’ve created new colonies from swarm cells (naturally, I suppose you could say), but that only seems to work well when there are several colonies in the area and the queens can mate with drones that aren’t their siblings (inbred queens can produce some seriously mean bees). Swarm Prevention — I don’t do anything fancy to prevent swarming. I try not to overfeed my bees in the early spring and I make sure the queen has room to lay by inserting drawn comb or blank or empty frames near the brood nest. If I find swarm cells, I move those frames to a new deep and start a new colony because everything else is too complicated and most other methods of swarm prevention, once swarm cells are present, just don’t work. That’s why the most useful thing in my tool box is extra stuff: extra frames, extra drawn comb (usually after a colony dies), extra deeps, extra bottom boards, extra feeders, etc. Natural Beekeeping — It’s easy to buy into the romanticized ideal of natural beekeeping. I know I did when I started. But beekeeping is no more natural than having carrots grow in a row. It’s a force of nature that we artificially encourage to develop in a specific way, in a manner that is convenient for us. The behaviour of the bees might be natural, but what we’re doing to them by forcing them to live in wooden boxes on a cold island in the middle of the North Atlantic Ocean is not natural. To keep non-native honey bees alive in a place where honey bees would otherwise never live doesn’t seem natural to me. While many good beekeeping practices follow the direction of the bees’ instinctive and natural behaviours, I’ve seen more natural beekeepers lose their colonies before the end of their first winter than anyone else by taking the so-called natural approach of not feeding their nucs sugar syrup during the first summer or by “letting the bees be bees” so that they swarm every summer and subsequently go into winter weaker and then die. There’s a point where so-called natural beekeeping, especially in a cold place like Newfoundland, is simply bad beekeeping. Weighing Hives — I don’t weigh my hives to determine if they have enough honey going into winter. I usually feed syrup in the fall until the bees stop taking it, which I know isn’t the best practice because sometimes it doesn’t leave the bees enough open cells to cluster in, but it’s easier than lifting hives and pulling my back out — and so far it’s worked well enough for me. One Size Frames and Supers — I don’t use medium supers for my brood boxes, though if there’s anything I’ve been tempted to do, that’s #1 on my list. Some well-known beekeepers like Kim Flottum recommend using only medium supers for everything, brood chambers, honey supers — all of it — because then all the frames are interchangeable and lighter to lift and more convenient for the beekeeper in many ways. It’s also argued that it’s easier for the bees to move between smaller frames of honey in the winter; therefore they’re less likely to starve during extreme cold spells. But I don’t know of anyone in Newfoundland who’s ever tried it. It could be a disaster. Which means I’ll probably try it soon. Candy Boards or Fondant — I don’t use candy boards or fondant to feed my bees in the winter mainly because I loathe making anything that requires boiling up sugar syrup. Over-heated sugar also creates a chemical compound called hydroxymethylfurfural (or HMF), which isn’t good for honey bees. Whether homemade or commercial, I avoid any product made from heated sugar, just to be safe. The Flow Hive — The highly romantic vision of beekeeping that everybody falls for is what brings most people to beekeeping (myself included), and it’s also the reason most people quit within the first two or three years. The reality is that beekeeping takes more time and effort and close attention than is ever revealed by any idealized vision of beekeeping — and nothing idealizes beekeeping more than The Flow Hive. Maybe it’s a great invention, but I don’t like how new beekeepers are deceived by it. While I don’t discourage anyone from getting a Flow Hive (I’d love to see if it works in Newfoundland), I’ve never been tempted by it because I know through experience that there’s more to beekeeping than turning on a tap. And I’m pretty sure adding a Flow Hive to all my other beekeeping responsibilities wouldn’t make my life any easier. Top Bar Hives — I was tempted by top bar hives when I started because I thought they were more natural, but I don’t think there’s such a thing anymore (if I did, I’d pick Warré Hives). I decided to go with Langstroths because they were much less hassle to set up and they’re a known quantity in Newfoundland. While I have no experience with top bar hives (though I did go with foundationless frames during my first year, if that matters), the type of hive one chooses to house their bees in probably doesn’t change the fundamental principles of beekeeping in Newfoundland. The bees still need to be fed as much as possible during the first year. Frames still need to be rearranged on occasion to make room for the queen to lay and to prevent swarming, etc. In other words, much of what I talk about on this page can be applied to top bar hives as well. Bee Brushes — I don’t use a bee brush and haven’t since I lost mine about four years ago. I just shake the bees off the frame because it’s quick and easy and doesn’t seem to bother the bees. Slatted Rack — I don’t use a slatted rack only because I don’t have the carpentry skills to build one. But I’ve always heard wonderful things about them. I don’t understand why rims (sometimes referred to as ekes and shims) aren’t sold as standard components for Langstroth hives. I use them all the time. Beekeeping Advice — The only advice I feel confident in passing on, other than all beekeeping is local beekeeping, is what I say in many of my videos: Listen to experience, not advice. Enthusiastic novice beekeepers, on the other hand, can easily view themselves as authorities on beekeeping after researching everything they can about beekeeping. I’ve seen people in beekeeping associations with little or no beekeeping experience assert their self-appointed authority by giving advice to new beekeepers, much of it bad and deliberately discouraging advice. That kind of thing destroyed my local association’s credibility for me. Some people just love telling people what to do. I can spot them a mile away because I used to be one of them when I first started beekeeping in 2010. I learned quickly, however, that the knowledge gained from actually beekeeping is astonishing and humbling compared to what I’d learned from my research on beekeeping. And it still is. Acting like a hotshot and telling everyone what’s what is the last thing I’d want to do. Although doing my homework is important, I’ve learned there are few absolutes in beekeeping and there is plenty of room for every beekeeper to discover through their own experiences what works best for them and their bees. This is important to me, so I’ll say a little more about it: Good teachers don’t use teaching opportunities to elevate themselves or to prove their authority to anyone. They share their experiences and knowledge with honesty, without ego, without pretense. The best teaching and learning happens through humility, for both the teacher and the learner. That’s how I’ve learned to be a good beekeeper (I hope). I know I’ve said all this before, but it was worth repeating because it summarizes the guiding principle of everything I do in my beekeeping and on this blog. Welcome to the wonderful world of beekeeping (no joke). It’s not so bad once you get in.